As part of the ongoing campus initiative Global Urban Humanities: Engaging the Humanities and Environmental Design, the Arts Research Center co-sponsored the Reimagining the Urban: Bay Area Connections Across the Arts and Public Space on September 30, 2013. Participants have been asked to submit a blog post "on a keyword you see debated in the Bay Area arts, policy, and planning landscape." This posting is by Kimberly Richards, a first year PhD student in Performance Studies at UC Berkeley. This post was originally published on the Arts Research Center blog, Muses. Over the course of the day we heard from artists and academics, designers, and commissioners, civic activists and arts administrators, and several of these presentations were collaborative in form. We celebratedintersections of artists with communities, publics with spaces, and artistic performance in site-integrated places. We learned about the cross-pollination of audience experience within We Players’ performances and the geographic specificities of building crossroads in the Tenderloin district. I admired the transparent maps that showed the movements of the city’s transportation and the efforts to produce transparent agendas at 950 Center for Art and Education. Vocabulary that indicated movement across, between, and amongst artists, communities, and places saturated the discussion, revealing the essential need to work together, forge partnerships, and build bridges across different and multiple disciplines. Reimagining the urban is an intensely local project, and there are pragmatic and political justifications for building from the ground up, but if we really are all one ecosystem, and we’ve accepted that we need to work across boundaries, what collaborations might we seek beyond the legal boundaries of the bay? How can we translate and interpret good ideas in other urban centers to suit the needs in our community? Who are theinterlocutors that can and should be mobilized, and what spaces do we need to create in order to facilitate these cross-cultural collaborations? As part of the ongoing campus initiative Global Urban Humanities: Engaging the Humanities and Environmental Design, the Arts Research Center co-sponsored the Reimagining the Urban: Bay Area Connections Across the Arts and Public Space on September 30, 2013. Participants have been asked to submit a blog post "on a keyword you see debated in the Bay Area arts, policy, and planning landscape." This posting is by Christina Gossmann, a second year in the Master of City Planning program at UC Berkeley. This post originally appeared in the ARC blog, Muses. The last session of the day, What is the “Bay” in the Bay Area? Creating Nature, acknowledged the elephant in the room—the Bay—but it also revealed the ambiguity of ownership surrounding this, “our” Bay. From Brad McCrea’s mention of changing legal rights (“Most things you can do on land, you can’t do in the Bay.”) to Louise Pubols’ historical account of the Emeryville shoreline as a “junky throw-away space” where artists/students/people were not afraid of “messing up,” we caught a glimpse of an immensely complex puzzle: public nature. The concept of public space is hard enough to define, let alone create, as planner after planner has learned in practice and we, as a class, have read and discussed this semester. Applied to natural space, the level of complexity around its publicness increases significantly—possibly naturally so. To enforce guidelines around public space and disallow appropriation, certain rules apply. In the face of nature’s vulnerability in cases of misuse, these rules weigh heavier. An exceptionally illustrative—and timely!—example is currently unfolding as a result of the U.S. government’s shut-down, enacted on Tuesday, the 1st of October: America’s 401 national parks are closed. Why? Because “the only way I can protect these places during this period is to shut them down,” as National Park Service Director Jonathan Jarvis told National Public Radio earlier today. 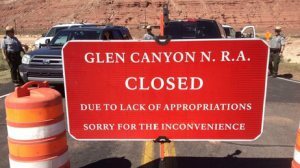 The government would expect vandalism, theft, poaching, if national parks remained open to the public without appropriate enforcement. Curiously, and somewhat confusingly, national forests remain open. On one hand, public forests have more access points than parks and are therefore, simply logistically, harder to control. On the other hand, “those lands are open to a wide range of public activities,” explains Jarvis. This reasoning is dissatisfying to me on multiple levels, and this is where I will bring us back to “our” Bay. 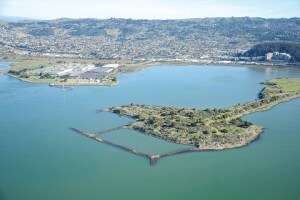 As Susan Schwarzenberg, Brad McCrea and Louise Pubols have engagingly articulated, the Bay is very much contested (just remember the “outlaws,” imperial powers and polluting corporations all claiming a piece of the Bay). Moreover, I would argue that, unlike National Park Service Director Jarvis claims, the extent to which land can be used does not determine, or even slightly influence, its access. Again, I’d like to point us to a timely example. The Albany Bulb is a landfill located just off of the Golden Gate Fields racetracks. Graffiti enthusiasts, dog-walkers and the homeless have been mingling on the half-island for years. In short, the land is used extensively. And yet, illegally. The City of Albany has recently voted to begin enforcing no-camping laws at the Albany Bulb. The 70-odd homeless are expecting the authorities any day now. My provocation is this: Maybe the question Linda Rugg raised around the extent to which we define ourselves as people living by the Bay and our impact on nature as well as nature’s (creative) impact on us, could be altered to become a self-examining one: Who is the “we” interacting with nature, and does every Bay Area resident have the access or right to this interaction? As part of the ongoing campus initiative Global Urban Humanities: Engaging the Humanities and Environmental Design, the Arts Research Center co-sponsored the Reimagining the Urban: Bay Area Connections Across the Arts and Public Space on September 30, 2013. Participants have been asked to submit a blog post "on a keyword you see debated in the Bay Area arts, policy, and planning landscape." This posting is by Katie Bruhn, a first year PhD student in Southeast Asian Studies at UC Berkeley. This post originally appears in the Arts Research Center blog, Muses. Throughout the daylong symposium, “Reimaging the Urban,” two particular keywords continued to jump out at me – reciprocity and layers. As I thought about these as individual concepts I realized that in fact layers of reciprocity was a much more appropriate way in which to understand the complexity of collaboration and exchange necessary in order for the projects discussed to succeed. The first panel began with a very clear example of the mechanisms and benefits of reciprocity. Presenting together in regards to the 5M Project, Deborah Cullinan and Andy Wang demonstrated how projects such as this are the result of collaboration across sectors. Deborah Cullinan in particular stressed the importance of the 5M Project for the sustained life of Intersection for the Arts while Andy Wang described how Intersection’s place within 5M has added a dynamic element to the project. Both have benefited from the other, however, what about local communities that surround the 5M Project? What is the 5M Project doing for them and how are they contributing to the development of the 5M Project? The question of local communities was carried over into Elvin Padilla’s discussion of the 950 Center for Art & Education located in the Tenderloin. Intended to benefit those that live around this site’s proposed location, 950 will in essence become a physical site of reciprocity. Art organizations will benefit from the multi-tenant structure that will create affordable studio and classroom space. Those that live nearby get to use this site while also redefining as Padilla described, the current identity of Tenderloin residents as “helpless.” Yet, Padilla also mentioned commercial aspects of 950, a boutique hotel, and office space. Again, we are made aware of the layers involved in this type of project. I could not help but question (as many of the audience members also did) who benefits more within these layers of collaboration and intended reciprocity? Considering the layers of interaction present in any type of development project such as 5M and 950 the question of equity emerges. While Cullinan, Wang, and Padilla’s presentations brought up the question of local community involvement in the development of new creative spaces, later presentations raised questions of government support. Joel Slayton’s presentation regarding ZERO 1 mentioned various examples including the Bay Bridge light project, which he described as “deeply complicated.” Such projects would not be possible without layers of mutual support, from the artists involved to the city agencies that control such public sites. The control over public space was again raised in the final panel focused on issues of environmental preservation in the Bay. Presentations by Susan Schwartzenberg and Brad McCrea, while each representing very different institutions or organizations, further highlighted how government agencies must work with local artists, creative institutions, and local communities in this process of reimagining urban space. Each of the presentations described above touched on reciprocity and exchange in a somewhat different way. Thinking about the layers of reciprocity (or intended reciprocity) present in any public or community project reminds us constantly of the importance of equity. Be it exchange with local communities or government agencies there is indeed a great deal of give and take – perhaps not always resulting in the desired outcome. The use by some of our presenters of the word “reciprocity” signifies a desire for mutual collaboration and equal benefit across sectors. As our presenters made clear, this question is a difficult one without a specific answer. It is something we must continue to work through in order to ensure equality within the various layers of exchange necessary for the successful outcome of any project that becomes a part of our urban landscape. As part of the ongoing campus initiative Global Urban Humanities: Engaging the Humanities and Environmental Design, the Arts Research Center co-sponsored the Reimagining the Urban: Bay Area Connections Across the Arts and Public Space on September 30, 2013. Participants have been asked to submit a blog post "on a keyword you see debated in the Bay Area arts, policy, and planning landscape." This posting is by Megan Hoetger, a second year PhD student in Theater, Dance, and Performance Studies at UC Berkeley. This post was originally published on the ARC blog, Muses. The long-term is a durational temporality. If I set this against the continuous present of the participle, ‘re-imagining’–the keyword which leads the title of the symposium–what kind of time do I find myself in? The call for the long-term engagement is a particularly fraught one for the field of visual art practice forcing the surface a series of questions, like: how long is enough for an artist to engage a community? How long should the dialogue be? How long does the project go? How long should the artist *be* in that space, or need she be there at all? What point, if ever, should/can she dis-engage and move on to the next community, city, country? When I shift these questions to arts organizations we might similarly ask: how long is long enough? And, coming more sharply in focus at this level, if long-term is the desired time, where is funding to sustain that continuous present coming from? How might that conflict with the very conceptual root of the continuous present action, to re-imagine? What costs must we / are we / should we be willing to pay to secure that duration temporality? And what do we imagine to be the relationship between the artist / the arts and communities across the long term? Radical Connectivity — Joel Slayton, director of the Zero 1 biennial in San Jose, delivered a presentation on the topic of digital public art practices, which is the focus of the biennial. Slayton proposed two forthcoming changes (which a consensus has agreed are forthcoming, although whose consensus I am not quite sure): the first, radical connectivity; the second, infinite data. The former brought ‘the radical’ to bear on the ways in which Cloud will revolutionize our connections, shifting us into a culture of reciprocity; that is, a culture of give and take. What Slayton’s proposition, as great as it sounds, seems to ignore is the basic issue of access that surfaces as soon as we begin to talk about Cloud and infinite data. Radical parasite– Raquel Gutierrez’s presentation on her work with the new program YBCA in Community brought ‘the radical’ to bear in a fundamentally different way, directly taking up issues of access. Gutierrez’s deployment of the term was paired to with a relation based on reciprocity but with a self-recognized leechlike relation. Gutierrez is from Los Angeles and only recently relocated to the Bay Area for this job at YBCA; here with within the communities in San Francisco, as a result, is as that of an itinerant outsider. What she proposed though, was not to try to overcome that status as outsider, but the possibility of operating as a radical parasite and working within the realities of uneven power relations and precarious duration to create space for youth outreach. Slayton and Gutierrez proposed seemingly opposing visions of a radical long-term relationship, so what do we make of the viability of the extended duration as a mode of artistic engagement? Can the relationship be both reciprocal and parasitic? As part of the ongoing campus initiative Global Urban Humanities: Engaging the Humanities and Environmental Design, the Arts Research Center co-sponsored the Reimagining the Urban: Bay Area Connections Across the Arts and Public Space on September 30, 2013. Participants have been asked to submit a blog post "on a keyword you see debated in the Bay Area arts, policy, and planning landscape." This posting is by Leslie Dreyer, a first year MFA student in Art Practice. This post originally appeared in the Arts Recearch Center blog, Muses. Session I seemed focused on creative business models for arts organizations and survival under neoliberalism, especially in the new tech boom. Andy Yang of Forest City described the 5M project, which is a 4-acre mixed use network of buildings and organizations, all of which Florida would categorize as belonging to the “creative class.” He mentioned new enterprise opportunities emerging from 5M, including a “homeless to hacker” success story, which showed what is possible but perhaps not probable for the majority of the surrounding disenfranchised community. He also acknowledged the low rate of community attendance during Grey Area Foundation’s (backed by 5M) Urban Prototyping Festival. I started to wonder how the arts orgs involved in the symposium interpreted “serving the community” and “community-based” art. Do they serve those fortunate enough to afford market-rate rent, those with a longer history of residency that are facing displacement, both? Deborah Cullinan, executive director of Yerba Buena Center for the Arts, emphasized wanting a “place at the table” and parity between the “indigenous” community (using a potentially controversial definition meaning long-time residents), arts organizations and developers, though she didn’t explain how this parity would be achieved. She said that “instead of standing on the sidelines in protest” they were going to “throw [themselves] into the change and make it better.” Unfortunately there wasn’t enough time for me to ask the questions: 1) Better for whom? 2) Instead of standing on the sidelines in protest, can’t we stand on top of the “table” (the one at which arts non-profits hope to sit alongside city reps, tech industry reps and developers) and not accept the change, specifically the displacement of long-time locals, as inevitable? 3) Who is not at the table, and is sitting there with “unlikely allies”(i) an act of survival of the fittest or solidarity for those who aren’t invited? In Session II the speakers described technology-driven urban arts projects while avoiding the equity question. The projects were “accessible” meaning one didn’t have to be tech savvy to use or understand them. Some of them appropriated vast amounts of user data prompting Dr. Teresa Caldeira to ask how technologies that collect such data is being / could be used in this era of expanding surveillance. Joel Slayton of Zero 1 responded that it was inevitable that it would be used to surveil the public but that the arts could be a “cultural watchdog,” which seemed to elude tech developers’ role in public surveillance and privacy infringement. Why were increasing inequity and surveillance imagined to be “inevitable” by many in this symposium, and what would it take to move participants to reimagine that they’re not? Is our only hope as artists or arts orgs to become “radical parasites,” a phrase mentioned by panelist Raquel Gutierrez, feeding off the tech industry for money and disenfranchised communities for content and perhaps more grant money (or is she using the phrase in more of a Robin Hood sense: feeding off tech to give to the poor)? I don’t have quick and easy answers as to how to achieve equity in a city with such high rates of evictions, economic inequality and unaffordable housing, but I know the policy changes that we need to stem the tide of gentrification and class-warfare, starting with mid-market as ground zero, require the sheer force of the masses. Will non-profits play a role in muting dissent, a critique posed in INCITE!’s book The Revolution Will Not Be Funded: Beyond the Non-profit Industrial Complex? Will they leverage their “place at the table” to inspire support for policies that help keep the disenfranchised in their homes and in the community arts programs designed for them? In what ways can artists reimagine the urban that makes equity inevitable? As part of the ongoing campus initiative Global Urban Humanities: Engaging the Humanities and Environmental Design, the Arts Research Center co-sponsored the Reimagining the Urban: Bay Area Connections Across the Arts and Public Space on September 30, 2013. Participants have been asked to submit a blog post "on a keyword you see debated in the Bay Area arts, policy, and planning landscape." This posting is by Hallie Wells, a third year PhD student in Anthropology at UC Berkeley. This post originally appeared in the ARC blog, Muses. What is spontaneity if not serendipity—a surprisingly pleasant encounter, saying yes to adventure, walking up the steeper street on a whim and being rewarded with the better view? Spontaneity, perhaps because of its association with creativity and positive action, popped up throughout the conference as a human potential that urban art projects and development plans should tap into. Spontaneous interactions can be facilitated by architectural and design features, as Deborah Cullinan and Andy Wang noted of the 5M Project, or by technological innovations such as those discussed by Joel Slayton of Zero1. From Jake Levitas we heard about the unexpected hand-holding with strangers made possible by the “I Just Wanna Hold Your Hand” urban prototype project, and Ava Roy gave an eloquent description—both at the conference and in her blog post—of the moments of spontaneous joy engendered by the interactions between the natural and built environment, performers, and audience members during the We Players’ performances. Spontaneity is not unique to urban environments, of course, but throughout the conference we heard calls for urban planners, arts administrators, policymakers, and artists to incorporate possibilities for spontaneous interaction into their projects. This seems particularly necessary as a means of countering the violent, painful, and troubling forms of spontaneity: police brutality, evictions, muggings, shootings, rapes, catcalls, stop and frisk, and on and on. The things that make us think twice about walking alone in certain places. The things that make us stop and stare or, conversely, avert our eyes. The things that, as Raquel Gutiérrez put it, make us hard. Of course, many of these things aren’t spontaneous at all, at least not in the dictionary sense of occurring through some inner impetus, without an exterior force. In the same way that certain built spaces and landscapes lend themselves to certain kinds of human interactions (dark alleyways at night, sunny expanses of grass …), structural racism, sexism, homophobia, and poverty make certain kinds of human interactions predictable. We are not surprised when they happen, except when they happen to us. And when they happen enough, surprise gives way to a mixture of despair, anger, and apathy. We may spend energy and time and money on a heart-warming project one day, and someone will steal it the next. BART platforms become murder scenes, daytime playgrounds host nighttime drug deals. In planning for the serendipitous moments of spontaneous connection, we cannot forget or ignore the possibilities for harmful confrontation. Is there a way to create projects that acknowledge these possibilities but provide opportunities—and reasons—to treat each other better? As part of the ongoing campus initiative Global Urban Humanities: Engaging the Humanities and Environmental Design, the Arts Research Center co-sponsored the Reimagining the Urban: Bay Area Connections Across the Arts and Public Space on September 30, 2013. Participants have been asked to submit a blog post "on a keyword you see debated in the Bay Area arts, policy, and planning landscape." This posting is by Alex Werth, graduate student at UC Berkeley. This post originally appeared on the Arts Research Center blog, Muses. One of the themes that we’re exploring in our seminar—entitled “The City, Arts, and Public Spaces,” and planned in conjunction with Reimagining the Urban—is that of publics and publicness. (See Shannon Jackson’s post for an overview of these many-sided concepts.) As a budding geographer, and a scholar of urban public space, I began the semester with the view that public space is public in the sense that it is, in theory, open to universal use, and that, to that effect, it is also a space in the sense that it is inhabitable. Of course, in practice, public space (so conceived) is always subject to prohibitions and exclusions that place inegalitarian limits on urban citizenship, limits that may be challenged, and perhaps changed, through appropriations of precisely those spaces—“public spaces,” like parks, streets, and civic centers—that name an ideal of publicness. I’ve been tested in this view, however, by the idea that we can point to neither predetermined publics nor public spaces, but rather to discourses through which publics may come into being. This latter idea can be understood simply (and perhaps simplistically) as the distinction between pre-formed and per-formed, or a priori and emergent, collectives. With this tension in mind, at Reimagining the Urban, I was struck by the similar many-sidedness of the concept of community. We heard about LIED to (“low-income, ethnically diverse”) communities, neighborhood communities, the Bay Area community (responsible for making collective decisions about the body of water at its heart), the arts community, and even the development community. Note that all of these collectives are pre-formed, or a priori. They exist somewhere. We can point to them, talk to them, represent them, and, at best, empower them (assuming we, ourselves, are members of, or have inroads into, them). I was struck by the sense that—for many of the participants, some of whom were “community organizers” or “community liaisons” by trade—the idea of community was something of a necessary concept, like a public might be for a “public official.” I found this surprising because I think of the artist as affecting our shared cultural lives through the production and circulation of texts, and thus likely to acknowledge that his or her work convenes an audience, and so helps to produce, rather than merely speak to, a community. Perhaps this performative notion of community too nears that of a public. If that’s so, then we should ask: What’s the relation between communities and publics? But rather than detour into that question, however useful it may be, I’d like to finish this post by proposing a concept of community as a group that shares cultural and linguistic norms, values, and practices. So defined, a community can, on the one hand, form through cohabitation, in which common cultures evolve through shared historical and geographical experiences. In this sense, communities can come to us a priori. On the other hand, however, norms, values, and practices can emerge out of contingent, even ephemeral, circumstances, and perhaps especially through an art practice that is extroverted. We can see this notion of community, in its dual aspects and temporalities, in Rebecca Novick’s post on site-specific art. In her final paragraph, she notes that, by attending a healing ritual at the Fruitvale BART station, she entered a “community” that she “[doesn’t] belong to.” Yet, at the same time, she explains that, “for everyone there,” the performance turned the site into “a place for community sharing, somewhere where perhaps healing can begin.” So, then, is or isn’t Rebecca a member of the community that grieves for Oscar Grant? In the spirit of the dialogue that emerged at Reimagining the Urban, I’d like to suggest that the answer is both–and. This post was originally published on the Arts Research Center blog, Muses. Raquel Gutiérrez invites us to map the room around us: who is here and how long did it take us all to get to 2150 Allston Way. For a moment, we acknowledged the morning’s journey that brought us to this place, and maybe even the bridges we had to cross to get here. Throughout the day bridges came up again and again in the form of projects, conversation, opportunities, performances and partnerships. Deborah Cullinan invited us to think of alleys as bridges, as spaces of circulation; she spoke of creating art bridges and using them to prepare new generations for what is growing around them. She reminded us that the word and is an important bridge, a word that provides circulation in our conversation and our evolution. A concept Brad McCrea returned to when touching upon the constant search for the balance between Conservation and Development in his work. Elvin Padilla spoke not only of the importance of bridging social work to the reality of real estate, of collaboration with unlikely allies and the complex negotiations that come from these partnerships, but he invited us to deal with the anxieties that arise from the act of crossing bridges. “Fear no art” and “Fear no tech” are indications that we need trust in order to cross, that it is important not only for us to build bridges, but to acknowledge the fears they provoke. Finally, he asks us to look at the long-term design: will the bridge be able to take the weight in the years to come? Ava Roy and Lauren Dietrich Chávez offer a performance space in which to experience bridge crossing hoping to recreate this experience in our everyday lives. Through the element of surprise, We Players create bridges within known spaces that take us into enchanted realms, where, as one of their audience members expressed, “Alcatraz is now Denmark.” But these interventions also aim to create bridges between the historic and the current in the spaces we inhabit, bridging new time and place within known spaces. Finally, as Linda Rugg asked, what does it mean that a bridge is open or closed? How does this force us to navigate in new ways? Susan Schwartzenberg takes us to the imagined bridge – the mid-bridge that is the pier, which stops you half way, immerses you in the bay, invites you to listen, to be within it. Within it and not above or below it – because this is the danger of the bridge: it can isolate us from what lies below and what lies above it. It creates, as Brad McCrea expressed, a static relationship with what we cross over. Bridges generate movement and allow for new forms of circulation, but bridges also speak of separation. So in this continuous building of bridges, let us keep in mind how they connect and separate, where they began and how they carry our weight into the future, how the acts of building and crossing change us, and what views new bridges unintentionally obstruct while they open our eyes and bodies to these new, enchanted realms. 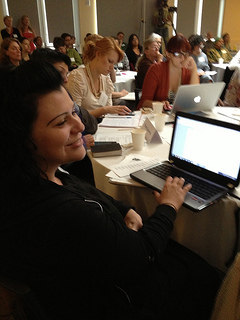 Reimagining the Urban participants have been asked to submit a blog post “on a keyword you see debated in the Bay Area arts, policy, and planning landscape.” This posting is by Elvin Padilla, Director of the 950 Center for Art & Education. It was originally posted in the Arts Research Center of UC Berkeley blog ARC Muses. how to bring art groups together with affordable housing groups together with social service groups together with youth groups together with parks groups together with community health groups and now, most recently tech companies, preoccupies me. the Tenderloin loses the struggle for equitable development because we are fragmented and undermine each other. advocacy for the arts preoccupies me. How does the following and Cy Musiker’s piece read: agitating? advocating? appeasing? matter of fact? demonizing tech? KQED’s Cy Musiker aired a piece last week critical to the city’s future: San Francisco Artistic Community Wants a Piece of Mid-Market. There’s good news! Supervisor Jane Kim, a big art and education advocate, is working on a special-use district to incentivize mid-Market developers to build permanently affordable space for art and education. Effective incentives could tip the scale at several mid-Market sites. At present, outstanding education groups interested in locating @ the 950 Center for Art & Education – Youth Speaks, Blue Bear Music, All Stars Project and Women’s Audio Mission – would owe the city nearly a million dollars in “impact” fees in order to revitalize three devastated blocks of blighted buildings, build the Center and bring their programming to at-risk Tenderloin youth. Clearly this does not make sense, particularly with the backdrop of a wealthy city – one that’s not assisting with funding the Center’s development – reaping huge revenues from a surging tech-driven economy and booming real estate market. Technically, of course, it is the groups’ funders that would owe the city for the “impact” of revitalizing three devastated blocks. Wouldn’t it be better if we could instead direct these resources to endow a 950 Scholarship Fund for low-income Tenderloin residents? Or endow an operating reserve to help our small non-profit groups get stabilized over the first few years? From Cy Musiker’s report: A few officials are listening, though. Supervisor Jane Kim represents Mid-Market, and she’s working on a measure to create an arts special-use district that would reduce developer fees on space reserved for nonprofits arts. It’s the kind of break that could help a Mid-Market arts company like Alonzo King’s LINES Ballet, which rehearses in a building without heat or hot water. Many hope this effort from a determined art & education-friendly supervisor, combined with the hoped-for leadership from our mayor, will give the Tenderloin a fighting chance for a measure of still-elusive equitable development (or at least heat and hot water!) in the face of the historic tech and real estate booms. I was accused of painting an us vs. them picture that’s hostile to tech in my KQED interview. i don’t get that. in fact, all of my writing and work at nomnic.org and tenderlion.org has been striving toward an us and them understanding, achievable largely through the arts. there’s so much anxiety, anger and resentment out there and it’s growing. as i see it, projects like 950 are tech’s and city hall’s best friend against this backlash. Assignment: Think of how to effectively communicate the need for the arts to bridge our increasingly polarized worlds. failing the neighborhood preoccupies me. failing the art groups preoccupies me: Will building a new debt-free state-of-the-art facility in the most ideal of visible and accessible locations be enough to position them for successful operations ongoing into the future? social justice practice vs. preaching preoccupies me: will funders show up to endow a scholarship fund for at-risk tenderloin residents who want to study art? or will they do so only if it satisfies some ideological construct far removed from the realities of the Tenderloin streets. the increasing polarization and stratification of our neighborhood preoccupies me. the housing is protected, the art spaces are largely not. we cannot live by rooms, meds and meals alone. poverty is more than a simple question of income. This piece was originally posted on the Arts Research Center blog, Muses. In 2002 economist Richard Florida published the Rise of the Creative Class. In it he argued that the best way for cities to revive their ailing urban economies was to remake themselves in order to attract a social category he called “the creative class.” At the core of this group were innovative and creative workers whose importance in the new knowledge-based economy could produce new companies, attract jobs and residents, and expand consumption. These benefits would then trickle down to re-ignite local economies, based on the “rising tide lifts all boats” principle. In spite of the fact that a number of previous “silver bullets,” also guaranteed to transform cities (festival marketplaces, sports stadiums, waterfront redevelopment) had largely failed, many cities enthusiastically adopted Florida’s prescriptions. Planners and politicians, hoping to create the kind of vibrant place that would to appeal to the “hip and cool” instituted a range of policies that ranged from subsidizing the arts to fostering the staples of bohemian neighborhoods, such as cafes, trendy restaurants, and loft-style apartments. Ten years later, after scholars had questioned nearly every aspect of Florida’s claims, the concept was largely discredited in academia. On the ground, the evidence was not much better. The results could be either tragic (as in Michigan’s “cool cities” campaign, subsidizing the arts in Detroit), unnecessary (as in planners’ support of Brooklyn’s “edginess”), or, more often, simply ineffective. One observer summed up its outcomes as benefitting the Creative Class while exacerbating inequality. Creative Class policies were particularly damaging to poor and minority areas, pushing up rents and displacing local businesses and residents. Although Florida’s current academic position as the head of the Prosperity Institute at the University of Toronto might already seem like a parody, his most incisive critic is the anonymous author of the parody twitter feed dick_florida. Described as “Talker. Doula for the creative utopia growing inside your city. Champion of the privileged since 2002. America’s #1 Virtue Industry,” his tweets effectively skewer Florida’s mixture of enthusiasm and obliviousness. Today, the concept of the creative class survives largely among real estate developers as the icing on the cake of standard development practices, used to sell projects to city officials and citizens. To more effectively brand their proposals, they’ve expanded their vocabulary to include “creative experiences,” “creative currency,” “creative environments,” “emerging economies,” “innovation” and “incubator.